Professor Martin Vernon, National Clinical Director for Older People at NHS England, has praised South Warwickshire NHS Foundation Trust (SWFT) for its forward thinking approach to caring for frail patients. 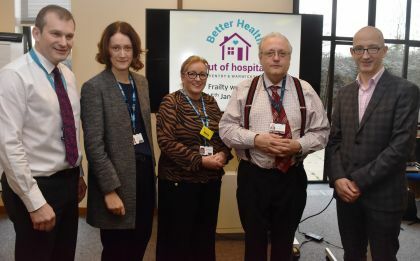 On Tuesday 15 January 2019 South Warwickshire NHS Foundation Trust hosted a workshop dedicated to frailty. Professor Vernon attended the event to present the NHS Long Term Plan in relation to ageing well and quality of healthcare in later life. Teams from the Trust’s acute services, Out of Hospital community services and Primary Care spoke about the pioneering measures in place to ensure frail and elderly patients are being cared for in the best environment. Specifically unnecessary admission to hospital has been reduced and a general philosophy of “home first” is actively promoted. Frailty is a distinctive health state related to the ageing process in which multiple body systems gradually lose their in-built reserves. Older people with frailty are at risk of being unable to respond to or recover from changes in their physical and mental wellbeing. The Trust is leading the way in caring for frail and elderly patients and this was highlighted by the successful pilot of Warwick Hospital’s Frailty Assessment Area (FAA), which has now been fully implemented. The aim of the FAA is to assess a patient for frailty upon arrival at hospital. This is to ensure specific needs are met straight away, which has a beneficial impact on their recovery. An approach described as “comprehensive geriatric assessment” is applied which is known to improve outcomes including mortality and independence at six months. The Trust is fully committed to changing perceptions of how elderly patients are cared for. It is collaboratively working with community services, primary care and the local authority to develop a joined up approach. This ensures people are cared for in the right place, whether this is at home, in hospital or in a care home.